VIPRE Anti-virus and Anti-spyware protection is now less than $50 for all of your home computers (PC). This anti-virus "home site license" costs $49.95 and lets you protect your computer, your spouses computer, the kids computers, with the latest antivirus and antispyware computer security software. First there was CounterSpy, which handled spyware and malware. Now there is VIPRE. VIPRE anti-virus anti-spyware keeps your computers safe but DOES NOT SLOW THEM DOWN. From Sunbelt computer security software, VIPER Antivirus or VIPRE works quickly and efficiently. This special edition is essential for those ON A BUDGET who need anti-virus and anti-spyware protection, yet its also for those who have more than one computer and do not wish to spend extra money. Its that simple. How does VIPRE anti-virus work? What does it do to protect me from spyware & virus threats? VIPRE scans for virus and spyware threats in real time without using your up your valuable PC resources. VIPRE protects your computer from virus threats as well as spyware, malware, and other potential problems whether you downloaded them knowingly or accidentally from an email, from the internet, or from physically connecting to your computer. The best part about our antivirus software is that it DOES NOT SLOW DOWN YOUR PC. This is not just your average antivirus antispyware software. From email delivered threats, Vipre anti-virus precisely supports Outlook, Outlook Express, and Windows Mail platforms , as well as any email program using POP3 and SMTP (found in Gmail features). Q: What else comes with the VIPRE anti-virus and anti-software "home license edition"? A: Our VIPRE 'home license edition' is not for the month but the whole year, on all of your PC computers. This annual subscription includes one year of threat definition updates, software upgrades, and live US-based toll-free technical support. 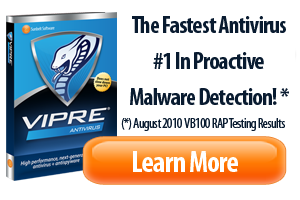 Vipre antivirus software is available 24 hours a day, 7 days a week. Click here to check out the order page, where you will find discounted pricing to cover multiple computers in your home / home office, as well as discounted pricing for additional years of service.